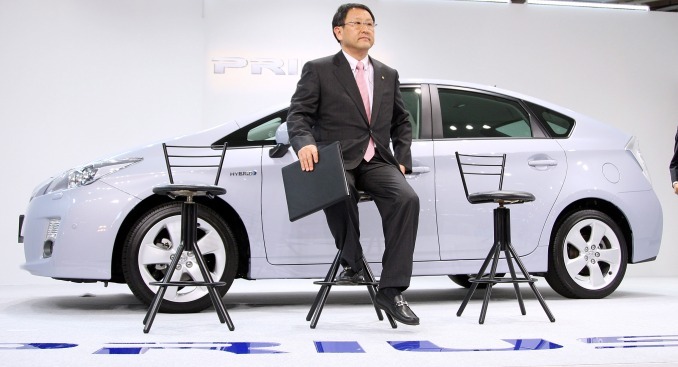 Akio Toyoda, Executive Vice President of Toyota Motor Corporation, introduces the third-generation Prius last year. What did they know and when did they know it? That is a question circling around Toyota executives as the world's largest automaker grapples with widening safety issues engulfing the company's most popular models. The Japanese automaker’s credibility has been showing stretches and strains ever since it first announced, last September, that it would recall 3.8 million vehicles due to a problem it described as “carpet entrapment,” a situation in which loose floor mats could snag the accelerator pedal and send a vehicle racing out of control. That came shortly after a California accident that killed a family of four, including an off-duty California Highway Patrol officer. Then Jan. 21 the automaker announced a recall for 2.3 million vehicles, most of which were already affected by the carpet recall, saying they could face potential problems with "sticking accelerator pedal mechanisms." Soon after, the carmaker also announced it would temporarily idle five North American plants and order a halt to sales of eight of its most popular models. But senior Toyota executives dismissed reports that the sudden acceleration issues might involve onboard engine controllers and other digital systems. “We have found no evidence” electronic systems can fail, declared Jim Lentz, president of Toyota Motor Sales USA, during a Monday news conference. He added that there are numerous “backups and failsafes” even if a computer control system did malfunction. Toyota's shifting positions have given pause to critics, including Transportation Secretary Ray LaHood, who has taken an unusually outspoken position on Toyota’s mounting woes in recent days. On Tuesday, he declared the maker “a little safety deaf” and a day later suggested, during a hearing on Capitol Hill, that owners of recalled products should stop driving them. He later backpedaled on that comment but said his agency would continue to "hold Toyota's feet to the fire." Those who might have come to the automaker’s defense are finding it more difficult especially in the light of developments involving the Toyota Prius, the world’s most popular hybrid-electric vehicle. At the time, Toyota downplayed the complaints, suggesting they might simply be the result of inexperienced drivers unfamiliar with anti-lock brakes. In fact, it was anything but. After stonewalling the media and owners for nearly six weeks, Toyota suddenly reversed course Wednesday. “Toyota is currently in the process of confirming these reports and investigating the vehicle driving conditions under which the reported phenomenon occurs," the company said in a terse statement. "It would be premature to comment until the investigation has been completed." That might have satisfied critics, at least until Thursday morning, Tokyo time, when the automaker revised its story yet again. This time, it not only admitted there was a defect, but made the startling revelation that it had already found the source of the problem and fixed it on third-generation Prius sedans that have been rolling down its assembly lines for weeks. So far, Toyota has declined to reveal the specific details of the “fix” nor given a precise timeline on when it concluded there was a defect, began work on the solution and made the necessary changes on the production line. The change in attitude apparently began in December, according to Hiroyuki Yokoyama, general manager of Toyota’s customer quality engineering division. He told Japan’s Nikkei newspaper that as the weather got colder, the complaints became more common and Toyota recognized it needed to do something. "We did not intend to cover up the issue,” Yokoyama said. What’s also missing, so far, is confirmation that the company will deal with vehicles built before the fix was in, so to speak, a sizable fleet. Nikkei reported Wednesday from Japan that Toyota intends to recall 270,000 Priuses in the United States and Japan, but Toyota's U.S. executives were unable to confirm that. Auto industry analysts say Toyota is now in serious danger of suffering a long-term hit to its credibility and reputation. The question is "whether consumers will no longer see this as a one-time problem and start to see it as systemic," said Dave Sargent, director of research for J.D. Power and Associates. The Prius problems are particularly troubling for the company, said Joe Phillippi, of AutoTrends Consulting. “These are Toyota’s most loyal buyers,” he said. "This is their halo vehicle and Prius owners are the ones most likely to talk up Toyota -- or talk it down." Toyota executives are likely to hear a lot more questions in the weeks to come. LaHood, for example, has confirmed that the government is investigating potential electronic problems in the Toyota vehicles. And LaHood's department is now holding a magnifying glass to other statements the automaker has made. LaHood said in an interview with The Associated Press, referring to Toyota executives, that federal safety officials had to "wake them up" to the seriousness of safety issues affecting the company's cars. "They should have taken it seriously from the very beginning when we first started discussing it with them," LaHood said, noting that regulators found support among Toyota’s American management but had to go to Tokyo to pressure officials at corporate headquarters to go along with a recall. The latest developments are particularly bad news for Akio Toyoda, the automaker’s president and CEO and member of the founding family which started out in the textile business – with the different spelling of the name. When Toyoda took over Toyota, early last year, he inherited a company with some unexpectedly serious problems. It reported a record loss for the year that ended March 31, 2009, and, to the new chief executive, was becoming bloated and disconnected from its roots — and its customers. Toyoda promised to refocus the carmaker, but the latest problems seem only to underscore the way the company has lost the vaunted focus on safety, quality and credibility that turned it into the world’s largest auto manufacturer. There are plenty of examples that show even the worst scandals can be overcome. Audi, devastated by its own unintended acceleration problems in the late 1980s is now one of the world’s largest luxury car makers. Ford has recovered smartly from the fiasco involving its Explorer, as has Firestone, the maker of the tires that had a propensity to fail on the Ford SUV. In fact, Firestone, a subsidiary of Japan’s Bridgestone/Firestone, reported record sales in 2009. But it took a decade to get back. No one knows how long the damage will take to repair at Toyota. With further investigations planned by the NHTSA and a pair of hearings scheduled on Capitol Hill, the process likely won’t begin for some time — and will likely hinge on the carmaker restoring some of its credibility.